Earlier this week, I installed Vivaldi browser, and decided to make it my default after reading CEO Jon von Tetzchner’s blog post about the potentially corrupt practice of suspending his company’s Adwords campaign after he was critical of Google. I have resisted browsers made from Chromium because I was never sure how much went back to Google, but seeing von Tetzchner’s honest blog post about Google’s alleged misdeed made me think that Vivaldi would likely look after my interests as a netizen. It wasn’t the only reason, mind. Firefox, and before that, Cyberfox (a 64-bit Firefox that had been my default for quite some time) had begun eating memory on my computer. The memory leak would still happen after I got rid of many extensions, and even on safe mode, Firefox took up a lot more space than I expected. Firefox had been having issues with certain ads from some networks for months, too, resulting in script errors. A screen shot of the Windows 10 Task Manager shows just how much memory Firefox ate in around 10 minutes, whereas at this point Vivaldi had been on for quite some time. It mirrors the experience I once had with Chrome, which handled memory and web pages so poorly that I began calling it the ‘“Aw, snap!” browser’ because of its regular crashes. The same problem that cemented my use of Firefox (and Waterfox and Cyberfox) has now happened to Firefox, forcing me to look for an alternative. First indications are that Vivaldi is a well made product, with a built-in screen-shooting feature and notes. There are some things that are harder to get to, such as a menu where I can customize which cookies should be blocked (I like living in a YouTube-comment-less world; I feel my IQ is preserved as a result), but overall I’ve managed to get myself the right extensions to mimic what I used to do on Firefox. I’ve also switched off the Google phishing and malware protection setting, for obvious reasons, blocked a bunch of cookies from dodgy big US tech firms (Google among them), and done the ad opt-outs. It might be marginally quicker, though if I was just interested in speed, Blaze beats Vivaldi and Firefox hands-down, and has a smaller memory footprint. However, a browser is not just for pleasure for me; if it were, then maybe this blog post would have been about another browser altogether. I’ve downloaded Blaze for my phone, and I’ll try it out soon. I wonder if this is a longer-term change. I remember beginning surfing on Netscape 1, and if I recall correctly, 1·2 had just come out so I actually began browsing in colour. Netscape stayed good till 4·7, and 6 was bloatware and truly awful. I switched to Internet Explorer 5 at this point, before moving to Maxthon (when it had an IE core, but its own interface). Firefox had issues back then with typography, preventing me from switching, but as it matured to v. 3, I went over and wasn’t disappointed. Chrome also had typographic issues for a long time. I invested a lot of time troubleshooting Firefox with the devs over the years, so I don’t make this move lightly. But there comes a point when a piece of software becomes impractical to keep. Firefox hadn’t changed much on the surface yet when it forces two hard resets a day, you have to make a hard call. If it weren’t for von Tetzchner’s blog post, I mightn’t have made the decision to use his company’s browser quite so readily. But it is a good product, even at v. 1·11. Vivaldi has obviously invested into making a decent browser from day one, and it’s not just for technologists and power users, which some seem to think. The fact it works better than Firefox should automatically make it appealing to the bulk of users, and if its CEO isn’t afraid to call a spade a spade when it comes to Google, the general public should be impressed. But, as we’ve seen, an honourable stand doesn’t always mean success: Duck Duck Go hasn’t overtaken an increasingly suspect Google, and people still flock to Facebook for social networking despite that platform’s privacy gaffes and unanswered questions about its forced downloads. I only hope that Vivaldi stays the course because the public deserves a product that hasn’t come from a morally questionable source. I realize software crashes can happen to anyone at any time, even Microsoft Windows president Steve Sinofsky, when demonstrating the new Microsoft Surface tablets in front of an audience in Los Angeles. However, it does remind me of the year where Internet Explorer 9 would not work on any of our computers. The question must be asked: if one of Microsoft’s own bosses can’t get Internet Explorer to work, what hope do the rest of us have? After this issue with Microsoft Internet Explorer 9, I went to the McAfee forums to record it so others knew. The McAfee volunteers and tech support guys have, in the last while, been fantastic. There’s one volunteer there, Peter, who’s always been right. So I would be foolish to ignore their advice. You can read the thread for yourself but after following these registry-cleaning suggestions, I downloaded IE9 again. Result: the same. IE9 doesn’t display anything. Pages are either all black or all white. That’s two out of two fails. It’s ofﬁcial: IE9 is the worst browser on the market and an absolute waste of time. Not that I would have ever used it—it was more intellectual curiosity to see how it compared to Firefox 4, Chromium and Opera. Conclusion: it doesn’t. I was prepared to put up with the epic fail of IE9, since I hardly use the program. In the years I’ve had IE8, I’ve only opened it accidentally (e.g. when certain programs are removed, they load IE for the ‘Why did you remove it?’ customer screen). But I forgot one thing: some programs rely on IE to display their information, like the Windows sidebar gadgets and McAfee. Bit of a problem when IE9 doesn’t actually display anything. So Microsoft’s ineptitude has consequences that reach far further than its crappy browser. I wish I could tell Microsoft. Many, many years ago, after registering some Microsoft product, I was asked to sign up to the Microsoft Network. So I did. Then, one day, Microsoft insisted that I sign up for a Microsoft Passport, because this was the one sign-on that I needed to get in to every one of its services. Well, I didn’t use any other than registering software. But I did anyway. Problem: that no longer works, because Microsoft now insists that I sign up for a Windows Live ID. MS, this is just stupid. In 1999, we had a Yahoo! Group list. We no longer run it after we moved our users on to an in-house mailing list. And, you know what? My little company, a fraction of the size of Microsoft, will still honour the requests from the old Yahoo! members. If we can keep old user data, how come Microsoft can’t keep hold of registered customers’ data and move it over to each successive service? How can I be assured that this doesn’t actually hook me up to a third Microsoft service when in fact I only expect one? Or was MSN for the 1990s, Passport for the 2000s, and Windows Live for the 2010s? That we have to change each decade because Microsoft doesn’t work on a long-term basis? Even though quite a few people suffer from the blank screen problem of IE9, Microsoft won’t be hearing it from me. 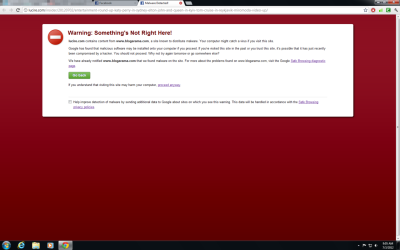 I understand that this bug had plagued IE9 even at beta stage, if the McAfee forums are to be believed. You’d think it would be pretty serious if an internet browser couldn’t display, but it looks like Microsoft never ﬁxed it for its ﬁnal release. The one thing it did right was providing instructions on how to remove IE9, which I followed tonight. I am glad my gadgets have returned, along with text in my McAfee security program. Frankly, I don’t think McAfee or any other software developer should rely on IE to deliver screens, though I can understand why, with the standardized installation of the program in Windows. What a pity, then, that Microsoft cannot deliver a browser that works with its own products.